It would seem, what a trifle to put socks in the closet. There is generally a separate drawer in which items are added in random order, in pairs or in the form of colorful lumps. When they accumulate a large number (especially in a large family where children grow up), disorder in the chest becomes a real problem. Meanwhile, quite neatly folded socks, and time on dressing up is greatly saved, and the underwear drawer is enough space. Place clean items in pairs, toe to toe, and gently flatten them with the palm edge. After this, twist a couple into a roll. This method of packing allows to save much space in the linen drawer. The rest of the rolls close to one another: on the one hand the product of dark, the other light colored; also, for convenience, separate the fine stuff from Terry and wool. So you can put socks on one shelf not only one but two or even three layers depending on the depth of the box. 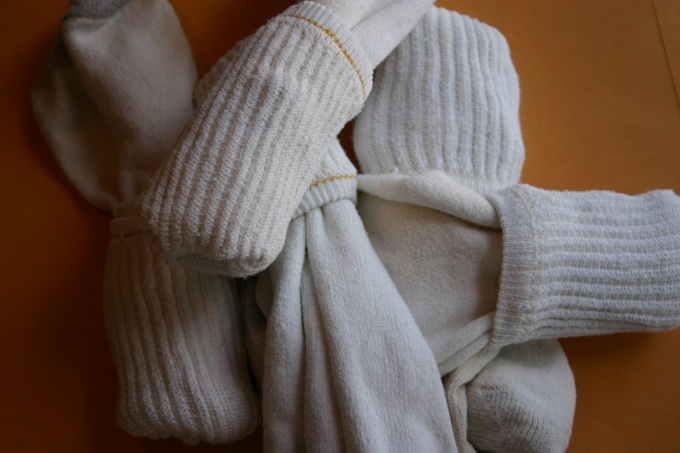 Matched pair of socks can gently roll, starting from the top of the fingers, three times. It is necessary to leave the elastic loose and pull it to the folded product. Spread the resulting figure to become flat. Folded thus, the socks do not crease and can be firmly set upright in the linen drawer. Use to restore order in the wardrobe of special dividers for socks. Is a convenient device that allows neatly folded socks separately in pairs; this does not necessarily sort items by texture, color, and size, each pair will have its own cell. You can buy industrial separators in shops for home or some furniture departments. They are offered in different versions, from simple plastic "cells", tissue boxes (saddlebags) to the adjustable wooden drawers of different depths with a refreshing scent of spruce wood. Functional device for the storage of socks can make with their hands. For example, buy strips of flexible plastic and making wave-like bends proclivity the walls of cells between them. You can glue or sew a hexagon or "trains" of cartons of small size. If you approach it with imagination, practical separator for socks may become a standard thing. Folding socks in the separator is conveniently a "tangle": a few folded, roll it into a roll, and pull the elastic to make a rag ball. Before laying socks in a cupboard is not recommended to iron them with a hot iron – so the gum would quickly fail, losing its elasticity. If necessary, walk through things a little warm off the iron, or just flatten them with the palm edge.